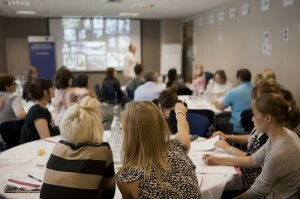 Our workshops update teachers’ own knowledge and build confidence in teaching this complex and emotive subject. All our teacher training is free, thanks to funding from the Department for Education and Pears Foundation. You will leave with access to a wealth of effective and engaging classroom resources. This workshop reveals the vibrancy and diversity of European Jewish communities on the eve of the Holocaust. Find out more about the ‘Jewish life in Europe’ teaching resources you will be able to access after attending one of our Core CPD days. This practical classroom activity uses an interactive timeline to provide a clear ‘big picture’ of this complex history, skillfully combining depth and overview in a profound and meaningful learning experience. Using details about Nazi decrees alongside personal stories of the victims, this workshop explores the impact of state policy on real men, women and children, creating a compelling interactive timeline that interweaves the narratives of multiple victim groups. Find out more about the ‘What was the Holocaust?’ interactive timeline teaching resource you will be able to access after attending one of our Core CPD days. Find out more about the teaching Being Human resources you will be able to access after attending one of our Core CPD days. Nunnery Wood High School students teaching our ‘Being Human?’ lesson to their peers. Challenging preconceptions and complicating prior assumptions should be an objective of any classroom. This is particularly important when students examine the long-term impact of the Holocaust on its survivors, on Jewish communities, and on Europe as a whole. Just as many survivors were able to build ‘normal’ new lives, others struggled on a daily basis with the legacies of the genocide. With Leon Greenman’s later life as an example, students confront some of the enduring consequences of the Holocaust as well as the persistence of prejudice and discrimination.